A less toxic alternative to chemotherapy could be in your spice cabinet. Scientists have come up with a potential new way to treat neuroblastoma, the most common kind of cancer in infants, by targeting it with nanoparticles loaded up with an ingredient of the spice turmeric. Turmeric is more often used to add flavour to curries, but the curcumin chemical it contains has shown promising progress in tests in destroying neuroblastoma tumour cells resistant to other drugs. If scientists can work out how to adapt this into a full and safe treatment, it would have the benefit of being less toxic and unpleasant for patients than traditional alternatives like chemotherapy – which is especially important when you’re dealing with young kids. “High-risk neuroblastoma can be resistant to traditional therapy, and survival can be poor,” says lead researcher Tamarah J. Westmoreland, from the University of Central Florida. 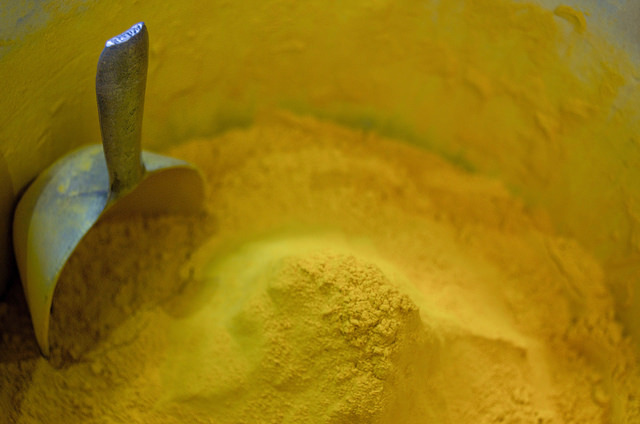 Using curcumin to fight cancer isn’t a new idea, but it’s difficult to get the chemical into drugs because of its low solubility and poor stability. Nanoparticles could fix that. During the study, cerium oxide nanoparticles loaded with curcumin and coated in dextran were shown to cause “substantial” cell death in neuroblastoma cells while having little impact on healthy cells – the perfect combination for a cancer drug. Even better, the nanoparticles were more effective against the type of cells usually most resistant to conventional drugs, those with an amplification of the MYCN gene. As neuroblastoma is usually very difficult to treat, that’s a promising start for these spicy nanoparticles. This type of cancer normally takes root near the kidneys, striking 700 people per year in the US, most of whom are under 5. Not only is it largely resistant to anti-cancer drugs, it’s also known to cause health problems after successful treatment, including hearing loss and other disabilities. It also often returns after treatment. If we can develop an effective nanoparticle approach to fighting neuroblastoma, it would be yet more evidence of the potential of treating disease at the smallest possible scales: nanoparticles have previously been shown to help kickstart the human immune system to help fight cancer, for example. Other recent research has looked at how nanoparticles can better target tumours in the brain by squeezing through the blood-brain membrane barrier, as well as reaching other places that conventional drugs can’t get to. The next step for the researchers behind the latest study is to see if the same positive effects can be observed in animal trials as well as lab tests. “We are hopeful that in the future, nanoparticles can be utilised to personalise care to patients and reduce the late effects of therapy,” says Westmoreland. The research has been published in Nanoscale.